Fossil Fuels, a symbiosis of organic matter and solar energy have developed over thousands of years, but are about to be consumed in little more than one century. Eliminating the time gap between economic action and its impact on the society is vital to the living conditions of mankind. Against this background, the application of clean and energy efficient technologies is key to successful businesses of the future. We have the knowledge and capabilities to get you there! Usually our clients face complex challenges once they approach us. We use to analyze these challenges in close collaboration with our clients. We develop solutions for these tasks and prepare the most advantageous way in consultation with the client. We define the time frame and cost of such interventions. We aim to exceed the expectations and take personal responsibility for achieving excellent business results. We offer comprehensive range of technical, economic, and commercial skills, based on its in-depth experience in renewable energies and energy efficiency at all levels. Our expertise covers electrical engineering, civil engineering, envirnmental science, institutional and regulatory framework design, economics, finance and project management. We act globally and and apply locally. Working in different cultures, climates, religions is our daily business. Even though there are similarities related to services, the type of business or technology, our clients are facing individual challenges in a global context. We define our services under consideration of the local reality towards your needs – case by case. We are a lean and modern company able to respond rapidly to changing conditions and requirements. Working under challenging physical environment, organizational cultures, economic climate and market conditions and geopolitical cultures is natural for us - and we adapt – in time! We can move our resources where they are most needed and seize moments of opportunity where the conditions for adaption and potential for impact are most promising. We are committed to using all our skills and expertise for the benefit our clients. We work together consistently, promoting co-operation and mutual support to achieve to deliver the best value for money. True sustainability goes beyond decreasing the environmental impact of economic activities. There must be good business sense. Sustainable business models help organizations produce tangible economic, environmental and social benefits and to build long-term business success. 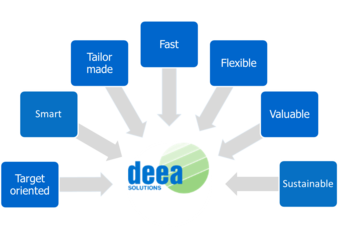 Sustainability is at the heart of the deea business.